The Quincy Street entrance to the Harvard Art Museum. Image taken on October 3rd, 2018. In 2010, Harvard University broke ground on the three year long renovation project to merge its three art museums – The Fogg Museum, the Busch-Reisinger Museum, and the Arthur M. Sackler Museum – under one roof. Architects not only faced the difficult task of building a structure large enough to fit such extensive collections, but they were further constrained by curators’ unique desire to exhibit paper-based drawings and canvas paintings side by side in the same gallery. For those unfamiliar with art conservation, it may seem like common sense to show all of an artist’s works together side by side, no matter the medium. And while art is art, the varying chemical structures of art media and materials mean that different pieces of art react in different ways to sunlight, temperature, and moisture. Because of this, paintings, paper-based drawings, and sculptures are historically displayed in separate galleries with individualized environmental settings. To design a space that would allow paintings and paper-based drawings to safely coexist, Harvard University hired Italian architect Renzo Piano. His solution was the piéce de résistance of the museum: the glass lantern roof. The roof is a glass, pyramidal structure composed of four sides of temperature and light controlled glass panelling. Members of the museum staff are able to adjust the amount of light coming in through the roof using a small remote device. While all four sides of the roof are visible from the outside, on the inside, the main focal point is the slanted expanse of glass over the Calderwood Courtyard within the entrance of the museum. This courtyard is where visitors purchase their tickets or can sit and enjoy refreshments from the museum cafe. From the seating within the center of the courtyard, one can gaze up and see the upper level of the museum’s galleries bathed in light. Glass roof as seen from the Calderwood Courtyard. Image taken on October 3rd, 2018. The skylight transmits light across the galleries, acting as what Piano calls “a light machine”. The museum is centered around the Calderwood Courtyard with galleries and arcades lining the four sides of the courtyard on each level. Upon entering the museum, it’s impossible to miss the rays of sunshine streaming in, and yet a tour guide will quickly tell you that the rays don’t come into contact with the fragile artwork a floor below the sculpture gallery. This begs the question, is there something special about the angle of the roof that allows the sun shining through to reach only the bottom and top floors? And assuming the angle of the roof was chosen specifically for the light-directing feature, is there some other angle that could accomplish the same task? To approach the question of what angles allow light to hit the interior courtyard and sculpture floor, yet spare those arcades with painting and paper galleries, imagine the profile of the interior courtyard as an irregular hexagon. The six sides consist of the floor, the walls of the courtyard and the three hypothetical panels of glass for the roof. The angles for the floor and the walls must be constrained (since we are assuming the walls meet the floor at right angles). However, there is potential flexibility when it comes to the angles forming the roof itself. Light is transmitted optimally when a glass pane is oriented perpendicular to the light. According to Linsdey Schiller, a researcher interested in greenhouse design, a 90 degree relationship between the light and the glass allows a full 90 percent of light to be transmitted through the glass (with the rest absorbed as heat). Any angle higher than 90 degrees results in some light being reflected off the glass or additionally lost from light absorption. To know what angle of incidence corresponds to the light rays in this way – hitting the glass full on – you need to know the angle of the sun for your particular location, a parameter that varies with both latitude and season. A conservative estimate would mean knowing the angle of the sun in the winter, since the winter sun tends to be lower in the sky, and so any calculation involving this lower angle will produce a slightly steeper pitched roof. Architects have often relied on the simple calculation of adding 15 to 20 degrees to the latitude of their build location to get a quick estimate of the angle that would be perpendicular to the winter sun. The question then is, is this the only angle? Schiller and her group studied the percent light transmitted with changing angles of incidence, and found that there is in fact a range of ‘good’ angles. From that initial ideal angle, angles up to 50 degrees lower won’t have a significant effect on the overall light transmission, typically changing light transmission by a few percent. Schematic of optimal angle of incidence. (Schiller 2015). The curious plateau of light that can be transmitted across a range of low angles and the steep decline in transmitting ability at steeper angles, suggests that it’s the detrimental effect of light reflection and loss due to light absorption that is governing the relationship between angle and light penetration. 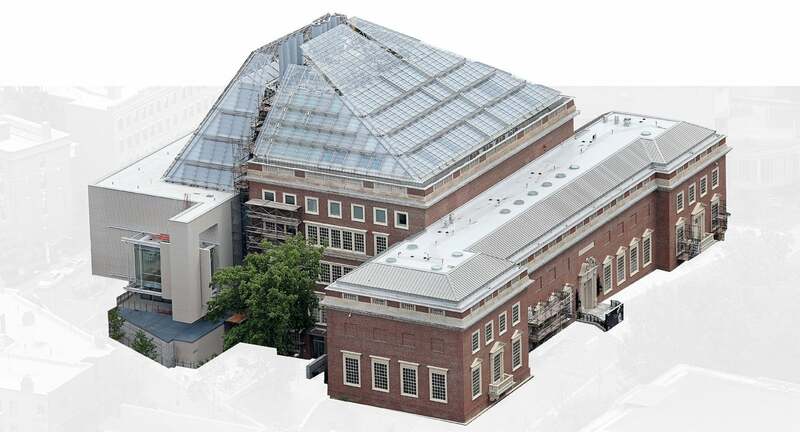 Since Cambridge has a latitude of approximately 52 degrees, the range of angles for the two sloped roof panes of the museum should be between 22 degrees (52+20-50) and 77 degrees (52+20). The actual angle of one of the museum roof panels was measured using imaging software to be 24 degrees, which falls nicely within this range. Sketch of the art museum. Arrows indicate potential light transmission as the sun migrates across the sky. To understand how the different sloped panels of the roof each individually contribute to the lighting we can think of the cross section of the building as having certain areas where we want safe from light. Since paper and painting artwork are stored on the first, second and third floors, they determine the areas where light should be excluded. In most buildings this would not be an issue, given that light from the roof would only illuminate the top floor. However, the open courtyard means light from the roof has the potential to reach galleries on lower floors. Because the height below which light should be excluded is the same on either side of the building, an aspect of symmetry is needed to ensure light hits either wing of the sculpture gallery optimally, without encroaching on the floors below. Exterior of the Harvard Art Museums highlighting the angled glass roof. Image taken on October 3rd, 2018.